One of the most dependable day-to-day appliances in many households can also become our home’s biggest headache when it fails. And when it breaks or, worse yet, floods the laundry area, problems mount quickly. So what can you do if your washing machine floods? We have a few solutions below. Remember that your safety and the safety of your family needs to come first. If your washer is located near large appliances like hot water heaters or HVAC systems, or near electrical wiring, it’s important to be careful. Is it safe to step into the room where the washing machine flooding occurred? You do not want to risk electrocution or other problems that may require medical attention. If you’re not comfortable entering the room where the washing machine flooding took place, that’s okay. Call the professionals for help. Next, ask yourself—where is your washer located in your home? If it’s in a place where flooding will do minimal damage—like an unfinished basement—that’s great news. However, if it’s located on a main floor or near furniture or flooring, you’ll want to spring into action quickly. Decide what your most important furnishings, documents, and similar items are that are near your washer. If you feel safe doing so, move those items to higher ground so that they don’t become damaged. If it’s too late to salvage special items, don’t worry. Water remediation experts at Paul Davis can help you restore everything from textiles to important documents, making them look as good as new. Once you’ve assessed damage and moved important things to higher ground, do what you can to clean up excess water. Laying down towels to sop up extra water may prove useful. Once the initial damage has been mitigated, you’ll want to contact a professional restoration service to help. That’s because even if water damage seems negligible (like in an unfinished basement) it can actually cause a lot of problems if not dealt with. Whether water crept into your walls or slid under the flooring, letting it linger can cause mould damage and more down the road. You always want to make sure that the professionals come in to assess the damage. And experts like Paul Davis will work with your insurance company to file a claim, saving you the headache of doing so. 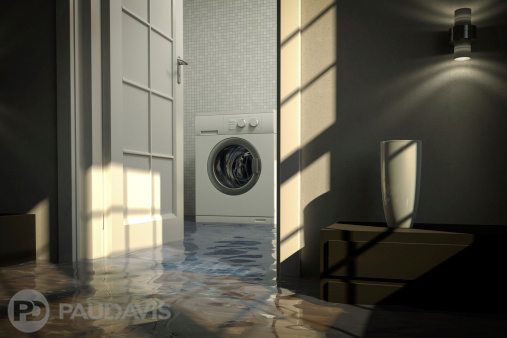 So if you get water damage inside your home from a washing machine flood, follow the tips shown above and remember that you can rely on the experts at Paul Davis for fast and thorough water remediation services. Because when water damage strikes, This is No Time For Second Best®.